WASHINGTON — Simmering tension between Senate Armed Services Committee Chairman John McCain and the Trump administration’s national security team over information sharing, the defense budget and Pentagon appointments boiled into public view last week. 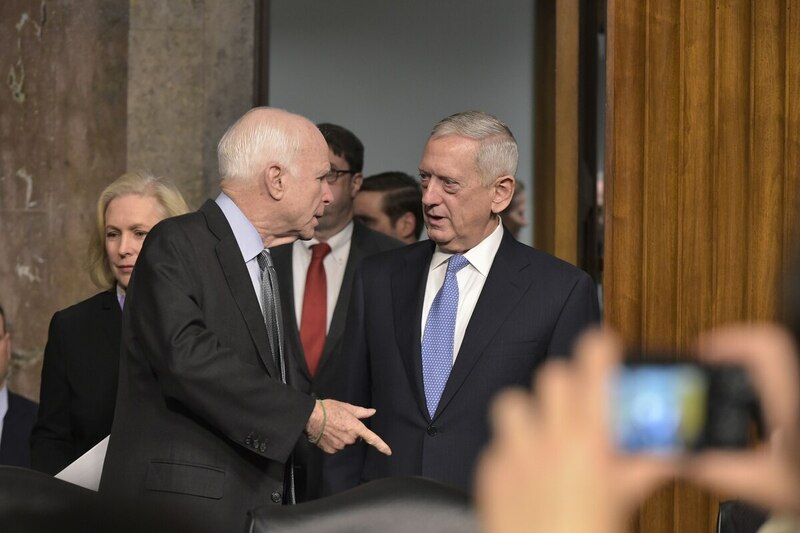 As the gatekeeper for President Donald Trump’s Defense Department nominees and the prime mover for the Senate’s massive defense policy bill, McCain is too powerful a friend for the Pentagon to lose. His message had instant impact, with both Defense Secretary Jim Mattis and national security adviser H.R. McMaster making the effort to meet with the Arizona Republican in person last week. But analysts say the rift is already affecting major budgeting and policy decisions. McCain wants more vocal support from Mattis as he calls for budgets to advance a large-scale military buildup. McCain needs ammunition as he’s been publicly linking defense budget caps to recent mishaps in which dozens of troops were hurt or killed. The strains came into public view last week when McCain told reporters the administration is keeping him in the dark about an ambush in Niger that killed four service members. This was a symptom of deeper problems, that the communication was better with the Obama administration’s defense secretary, Ash Carter, than with longtime friends. McMaster, after meeting with McCain, told reporters that the senator’s comments “hurt my feelings” and pledged better communication with the chairman. “This is a problem we can solve,” said McMaster, who in August received backing from McCain against a wave of criticisms from the far-right. Asked about McCain’s comments, Pentagon spokeswoman Dana White downplayed tensions. “I would say that we have done all we can and we will continue to strive to do as much as we can to ensure that Sen. McCain and all the members of the SASC and the [House Armed Services Committee] have exactly what they need when they need it,” she said Oct. 19. McCain’s Carter comparison was tough talk. In President Barack Obama’s final year in office, McCain jousted with Carter and the administration over the defense budget, his reform efforts and his slow-rolling of Defense Department nominees. At one point, McCain vented over a frayed relationship between Congress and the Pentagon’s civilian leadership when Carter denied McCain a courtesy preview of the 2017 Pentagon budget. Though McCain has a history of tension with past defense secretaries, Mattis’ unique reliance on a close-knit group of advisers, rather than the broader expertise of the department, may have caused him problems. “What is unique here is Secretary Mattis is, so far, really set up poorly for managing his ties to Congress,” said Loren DeJonge Schulman, a former Department of Defense and National Security Council official under Obama, who is now with the Center for a New American Security. “His relationships with McCain and others should, by necessity, be very different than when he was at [U.S. Central Command]. “He is lacking a full team that can both ease the burden of interfacing with key members and highlight to him when an issue on the Hill really demands his attention before it gets out of hand, like McCain’s earlier commitment to hold up nominees. Sen. John McCain says he is refusing to advance President Trump’s nominees to the Pentagon until he is satisfied the administration is communicating its plans for the wars in Afghanistan and Iraq. The concerns on Capitol Hill are substantive. McCain said he fears the administration lacks a plan for the aftermath of military actions in Syria, should the Islamic State group be defeated, something highlighted by the Oct. 20 announcement that U.S.-backed Syrian rebels have taken Raqqa, the de facto capital of ISIS’ so-called caliphate. There’s also a budget disconnect that began with the fiscal 2017 supplemental spending request, when defense leaders in Congress believed the DoD artificially lowballed their budget amendment based on its reading of the political landscape, according to Mackenzie Eaglen, a former Pentagon and congressional staffer with the conservative American Enterprise Institute. “Chairman McCain would prefer to stop the shell games and just be straight with Congress,” Eaglen said. Earlier this month, McCain said he would refuse to advance Trump’s nominees to the Pentagon until he is satisfied the administration is communicating its plans for the wars in Afghanistan and Iraq. As SASC chairman, he sets the schedule for DoD nomination hearings, and as a senator, he may request a hold on any presidential nominee. Also fueling tension, according to Eaglen, is the snail’s pace at which the Trump administration has announced Pentagon nominees, Mattis’ preference for Democrats in many senior positions, and the tight control of access and vetting in the hands of a very small number of people in Mattis’ front office. The same day McCain made his comments about Mattis and McMaster, David Trachtenberg finally got a vote in the Senate and was confirmed as deputy undersecretary of defense for policy. The SASC’s top Democrat, Rhode Island Sen. Jack Reed, said the path looks clear for other DoD nominees awaiting Senate votes, since the Senate has moved on from health care reform. Much like Trachtenberg, John Gibson, the pick for deputy chief management officer, as well as Navy general counsel nominee Charles Stimson and Owen West, Trump’s choice for assistant defense secretary, have been waiting since July.